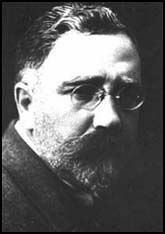 Citation: C N Trueman "Lev Kamenev"
Lev Kamenev was a leading Bolshevik who followed Leninafter the Social Democrats split in 1903. Kamenev like so many other ‘old school Bolsheviks’ paid the price whenJoseph Stalin’s purges took place in the mid-1930’s. Kamenev was born in Moscow on July 16th 1883. Both his parents had been involved in radical politics so it was not unusual when Kamenev himself drifted in that direction when he joined the Social Democratic Party in 1901. His reputation for siding with radicalism initially stopped him from getting into university but the government gradually relented and he was allowed to study Law at Moscow University. However, Kamenev was thrown out of university after serving time in prison for organising a student demonstration against Tsar Nicholas II. After this Kamenev took to working as a propagandist among railway workers informing of their rights and what for them would be a fair society. But clearly this was a potentially dangerous move and Kamenev knew this. So he moved to Paris in 1902. In Paris he met Lenin and Kamenev followed him to Geneva when Lenin decided to move there. Kamenev became a devoted follower of Lenin and also a leading light in the Social Democratic Party. Kamenev agreed with Lenin’s belief that the working class needed a group of highly skilled professionals who would act for the working class on their behalf. This caused a split in the party as some, led by JuliusMartov, wanted to involve as many people as was possible in the cause. Lenin lost a party vote on the issue but refused to accept the result. This ended in the Social Democrat Party splitting in two. Some, called Bolsheviks, followed Lenin while some called the Mensheviks followed Martov. Kamenev followed Lenin. Kamenev then returned to Russia where he spent his time organising strikes. He was arrested and spent time in prison. On his release, Kamenev toured Russia and made speeches on behalf of the party. During the 1905 Russian Revolution, he organised rail strikes in St. Petersburg. In the aftermath of the 1905 revolution, Kamenev became a marked person. He decided that once again for his own safety that he would have to leave Russia. In 1908, he joined Lenin in Geneva. In 1912, both Lenin and Kamenev moved to Krakow so that they were nearer to Russia. When ww1 broke out they decided to move back to Switzerland. Kamenev returned to Russia after the overthrow of Nicholas II in 1917. He soon became active in the Bolsheviks attempt to overthrow the Provisional Government led by Alexander Kerensky. As part of the campaign to spread the Bolshevik message, Kamenev became co-editor of ‘Pravda’. Lenin now called for a full-scale workers revolution against Kerensky. This was the only occasion when Kamenev and Lenin disagreed on policy. However, Kamenev quickly agreed with Lenin and supported theOctober Revolution. Lenin then used Kamenev to explain the workings of the Bolshevik Party to foreign governments. He was sent to London but swiftly deported. Kamenev then went to Finland where he was arrested and imprisoned. He was returned to Russia after a short time. On his return to Russia, Kamenev was elected Chairman of the Moscow Soviet. This gave him huge power within the party. He, Gregory Zinoviev and Joseph Stalin formed the Triumvirate that planned to lead the party after Lenin had died. However, Stalin had no intention of sharing power. Once he had neutralised the threat of Trotsky, he felt powerful enough to discard Kamenev and Zinoviev. Stalin used his influence in the Central Committee of the Bolshevik Party to get Kamenev expelled from the party after they criticised his policies. Kamenev’s days were effectively numbered once Stalin believed that he had achieved full power in the USSR. In 1934 Kamenev was arrested on a false charge of being involved in the assassination of Sergy Kirov. He was found guilty and sentenced to 10 years in prison. In 1936, Kamenev was accused of trying to murder Stalin and other senior Bolsheviks. He was found guilty in a show trial and executed on August 25th1936.